System Protection of Windows may take up to 10% or more of disk space to save System Restore points and Previious Versions. 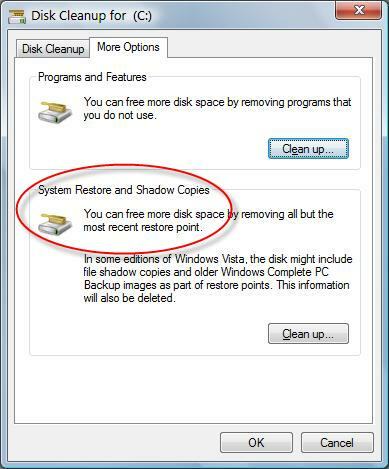 Other than change the limit of System Protection disk usage allocation to reduce allocation amount and free up the space, you can also immediately delete and reclaim almost all space used by System Restore and Shadow Copies (including Previous Versions) by using Disk Cleanup Manager to eliminate all but the most recent System Restore point. Type disk cleanup in the Start Search box. Click Disk Cleanup from the search results list. Select Files from All Users on this computer option, or tap or click on Clean up system files. If prompted, click or tap OK on Disk Space Cleanup Manager for Windows User Access Control permission request dialog. If you have more than one drives, choose a drive letter from the drop down list which you want to delete the System Restore points, and press OK. Disk Cleanup will perform calculation to determine how much space it can free. Once done, click on More Options tab. Under the section of System Restore and Shadow Copies, click on Clean up… button. Click on Delete button when asked whether are you sure you want to delete all but the most recent restore point. Disk Cleanup will erase all old restore points or files and the space will be reclaimed for everybody use. You can check the reduced space used by restore points and shadow copies with vssadmin List ShadowStorage command. Note that when you delete System Restore old restore points to reclaim or free up some space, the availability of the old except the last Previous Versions files will also be erased and no longer accessible. Beside, this trick also does not change the limit on how much space Volume Shadow Copies and System Restore can use.